Best Software for 1-to-1 Laptop Program Deployment. When it comes to school-wide initiatives, educators spend a lot of time discussing the process and what to prepare in order to make the deployment of technology in schools as smooth as possible. A 1-to-1 laptop program deployment (also know as 1:1 initiative) is no different from others that schools are tackling recently. While it is a noble endeavor to pursue the smoothest laptop program deployment possible, our team at Administrative Software Solutions works very hard to lessen the burdens of the implementation. Our aim in doing so is to allow educators to spend more time doing what they do best, teach students on the proper use of the technology tools. Our research lead to the creation of a cloud-based software solution that takes away the burden of the distribution, repair tracking, communication to all stakeholders about the devices selected for the one-to-one laptop initiative, and dealing with disciplinary issues related to device mishandling and misuse. 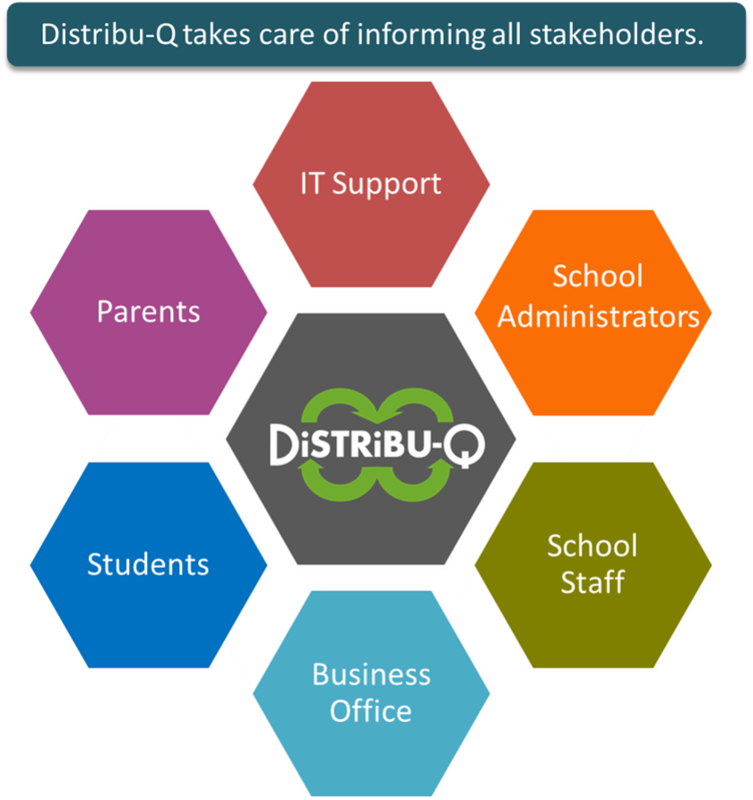 Distribu-Q is created to help school technology administrators in the deployment of 1-to-1 laptop programs. This is a unique and complicated undertaking. Our aim is to lessen the burden of deployment by creating a software solution to meet the needs of IT Support in administering the 1:1 (one-to-one) technology initiative specifically designed for school environments. 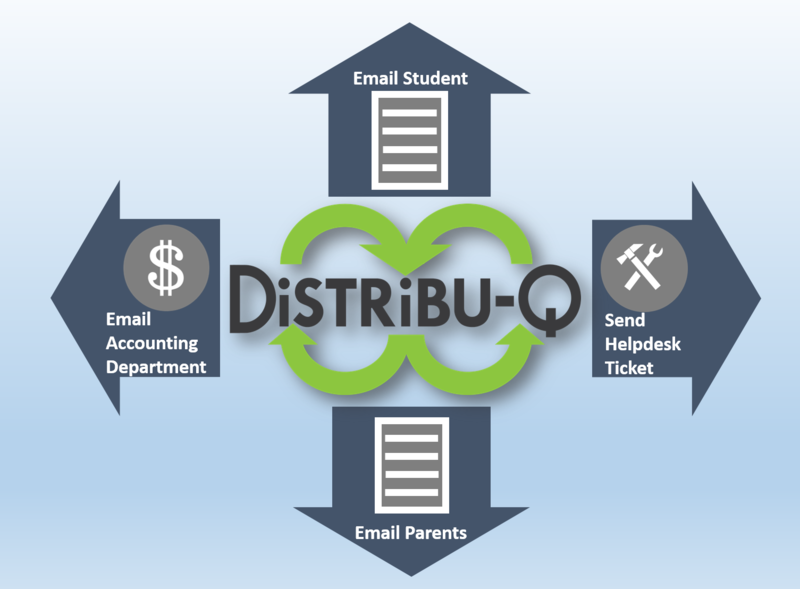 Distribu-Q helps the IT support keep track of disciplinary issues related to the device and communicate via automatic emails to school administrators. Our click and go interface offers real-time updates to the databases and no need for advanced skills or knowledge using Excel, Google spreadsheets or other databases. This allows office personnel a chance to provide efficient primary technical support in the least amount of time possible. DiSTRiBU-Q not only helps your personnel with the 1-to-1 laptop program deployment, but with repair tracking, communication to all stakeholder and dealing the disciplinary issues related to device mishandling and misuse. Our solution keeps track of the repair status of the device and is designed to record the cost of the repair as well. If you wish, the latter can be communicated digitally to the appropriate business office personnel so that they can begin the billing and payments process for these repairs. Communication is key when it comes to dealing with any technology initiative and DiSTRiBU-Q provides a built-in communication solution that will automatically communicate the repair cost to the appropriate person. 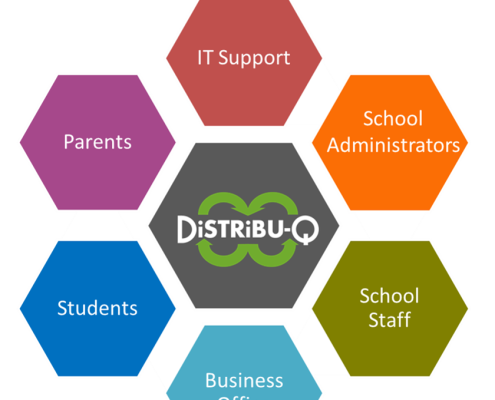 Distribu-Q is designed for 1-to-1 laptop program deployment in schools. Parents play a major role in the education of their children. Since this equipment can be costly and any repair falls on the shoulders of the parents, Distribu-Q is capable of keeping parents informed via email about the type of equipment checked out, the repair status of the device and the costs associated with each repair. In addition, Distribu-Q keeps a running record of the disciplinary issues related to the improper handling of the device. Students are affected most by 1-to-1 laptop program deployment and technology initiatives. The faster one can get the right device in the hands of students, the better. 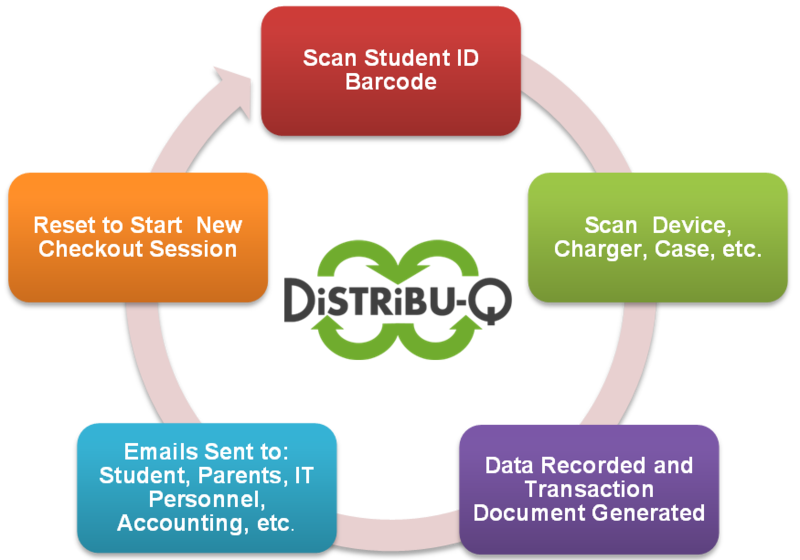 Distribu-Q is optimized to: make the checkout of the equipment efficient; inform the students of the repair status and keep track of all items checked out including loaner devices. By keeping track of the disciplinary issues related to the device and automatic communication to administrators, students will less likely come to school unprepared to use the devices. WHY OUR PRODUCT IS THE BEST SOLUTION FOR YOUR 1-TO-1 LAPTOP PROGRAM INITIATIVE DEPLOYMENT? Administrative Software Solutions is offering to its clients a smart product which makes 1-to-1 laptop program deployment easier than ever. We know how complicated the logistics can be when distributing devices to students, keeping track of the repairs, keeping constant communication with all stakeholders, swapping equipment and keeping track of the disciplinary issues related to the device mishandling and improper use. As a matter of fact, our software solution was born while we participated in 1-to-1 laptop program initiative team meetings similar to what is happening in many schools all over the country. Our research lead to the creation of a cloud-based software solution that takes away the burden of the distribution, repair tracking and communication to all stakeholders about the devices selected for the 1:1 initiative. Recently, we have added an automatic email function that aims to keep school administrators informed about the disciplinary issues related to the devices distributed to students. Our turnkey software solution will make the deployment process easier, efficient and cost effective. We thought of every possible situation our clients may encounter during the integration of 1:1 (one to one) technology in schools and we created an easy to use solution. However, we are constantly listening to our customers about what they encounter during laptop distribution in schools and we are integrating solutions for the issues brought to our attention. On our own field observations during our years of hands-on experience in schools. On the input from educators, school administrators and board members. On the latest educational research findings. On the changes to the laws and policies mandated by school districts policies, local, state, and federal governments. Our mission is to make a difference in students’ lives and learning by providing the appropriate fail-safe systems of accountability. Our hope is to make it easier for administrators, teachers and educational support individuals to run the schools efficiently and effectively so that they are freed to do what they do best, build positive relationships through interacting and guiding students. Our promise to you is to make our continuous improvement process based on your needs, the customer. Therefore, we are at the ready to listen to your concerns and suggestions to create new software solutions or improve our existing products. Because of clients like you, DiSTRiBU-Q has come to be known as the best and smartest cloud-based software for 1-to-1 laptop program deployment, distribution, repair tracking and communication solution. Our fixed setup fees combined with fair per-student rates allow a gradual implementation of 1-to-1 laptop program deployment. When it comes to the importance of information, accessibility is at the top. As long as you have Internet connectivity, you have access to your 1-to-1 laptop program deployment through Distribu-Q. Up time is of great importance and the speed of 1-to-1 laptop program deployment and distribution are key to the highest up time possible. With our bulk upload option, Distribu-Q will be ready for you to use in a flash. We are aware that not everything goes as planned when it comes to 1-to-1 laptop program deployment. 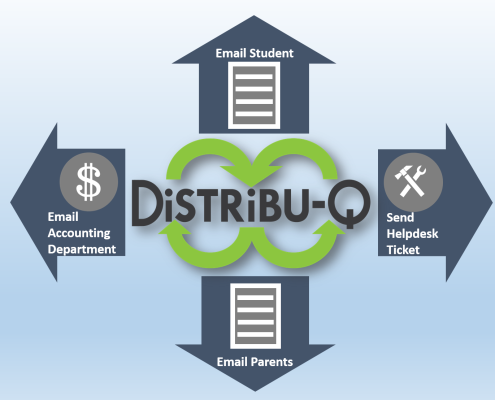 That’s why Distribu-Q provides a feature to add a new student account on-the-fly. Technology is ever-changing. If you happen to get a new piece of equipment for your 1-to-1 laptop program initiative that’s not in the database, Distribu-Q provides a feature to add new equipment information on-the-fly. Because we are in charge of the hosting, our tech support personnel is able to solve issues related to 1-to-1 laptop program deployment immediately.